In some of our previous blog posts, we discussed the complexity of touch sensor design. The main takeaway of those posts was that touch sensor technology isn’t as mature as it seems and engineers should investigate their designs thoroughly before producing them. Each design option is essentially a trade-off between the sensor’s sensitivity and its mechanical properties. So, in order to achieve the optimal trade-off, you need to iterate your designs and measure the performance of each variation. This is also something we’ve discussed before, and we concluded that the best way to do this, is through simulation. While many engineers assume that solving time is the most important metric to consider when choosing which software to use, it’s actually preprocessing that is the most time consuming aspect of a simulation. To combat this, there has been a shift towards simpler, application specific simulation apps that automate most of the steps of the preprocessing phase, alleviating the pains of the engineers and substantially speeding up the process. 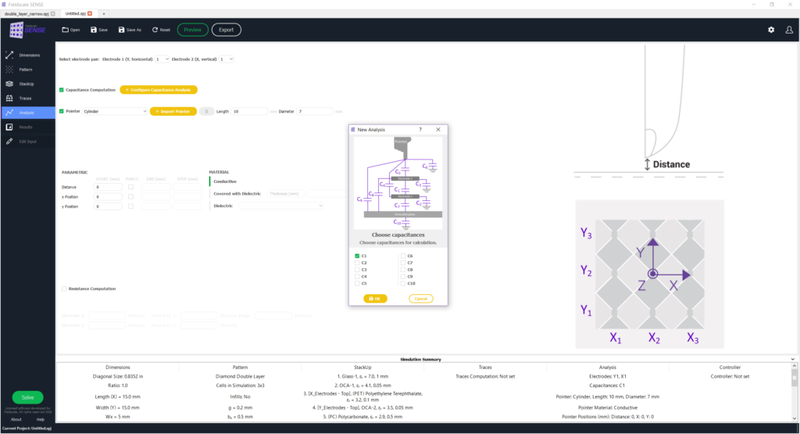 In this blog post, we’re going to see how a traditional, multi-purpose simulation tool compares with an application-specific one, when it comes to designing and simulating the exact same touch sensor. Additionally, we will see how you can achieve design iterations with slight differences (e.g. the thickness of the top Glass layer of the touch sensor) in each case. For the sake of this example, we will design from the beginning and solve a 6-layer Diamond Double touch sensor with two different tools: our in-house developed software, CHARGE, which is a generic simulation tool, and our application-specific software, SENSE which is exclusively for simulating PCAP touch sensors. In other words, we will solve this example project the hard way and the easy way, and compare the processes. Spoiler alert: Fieldscale SENSE is the easy way! A render of the sensor we wish to simulate. As you can see it is a touch sensor with a six layer StackUp, with diamond double pattern electrodes. This is a common touch sensor pattern that can be used for various touch screens. The reason we chose diamond double pattern for the electrodes of this example is because it is a known and simple technology, but at the same time effective, and can be easily simulated. Compared to other common patterns, such as Manhattan, the use of diamond double pattern can lead to a more sensitive touch sensor. Cover glass: Finally, on the surface of the sensor there is the cover glass which is 1mm thick. OCA: On top of this layer lies the X electrode, right below another OCA layer (0.05mm). Polyethylene Terephthalate (PET): Above the Y electrode there is another layer of dielectric, Polyethylene Terephthalate (PET) this time, with a thickness of 0.1mm. 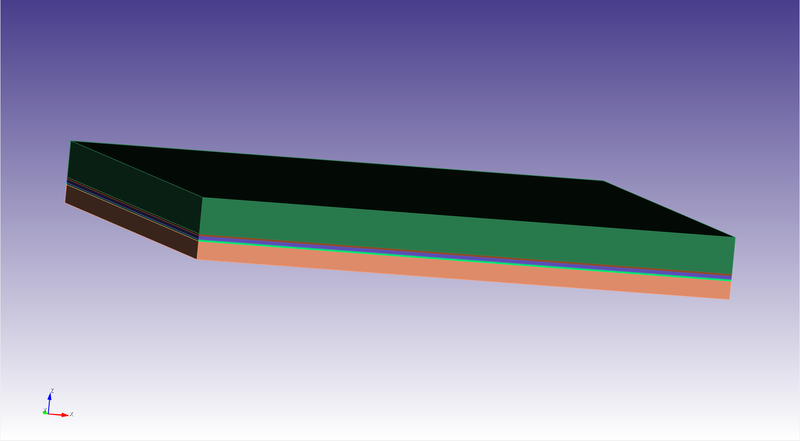 OCA: a 0.05mm layer of OCA, on top of which lies the Y electrode. Polycarbonate (PC): a 0.5mm layer of Polycarbonate (PC) that acts as a dielectric. Grounded plane: A grounded plane i simulates the LCD or OLED screen that exists under the touch sensor in smartphones. You can see the layers of the StackUp in this side view of the touch sensor. Alright, since we’ve got the aspects of the design, apart from the cover glass nailed down, let’s go and simulate it! First step of each simulation is to create the geometry. To do this, you can either design the geometry within the tool, or write a script that creates it for you. Both of these ways can be extremely time-consuming, especially for non-experts in simulation on users not familiar with scripting. Of course, if you have already designed the geometry in a compatible with the software tool, you can import it. 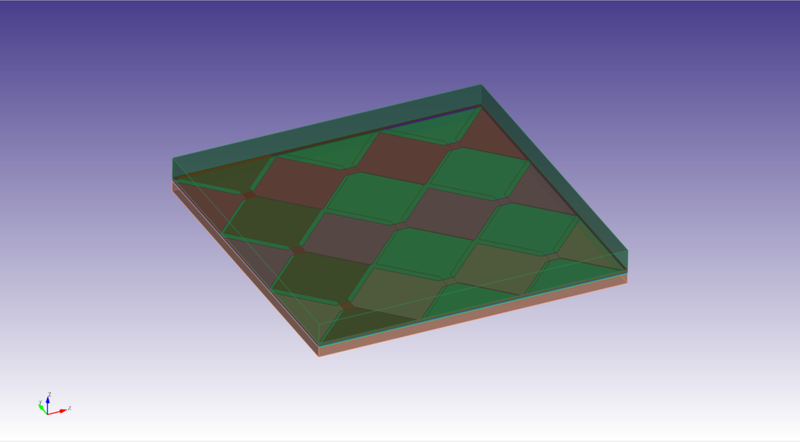 In our example, we used the geometry operations from the command panel to draw the diamond shaped electrode surfaces. Left: the commands used for creating the respective curves. Right: the commands used for creating the necessary surfaces from curves. For an expert user, it takes about ten minutes to draw or script a simple 2D geometry, like the one in our example. It would take half an hour -or more- for a non-expert user, with only a basic understanding of simulation, even more so if he would have to go through the steep learning curve of a CAE tool. 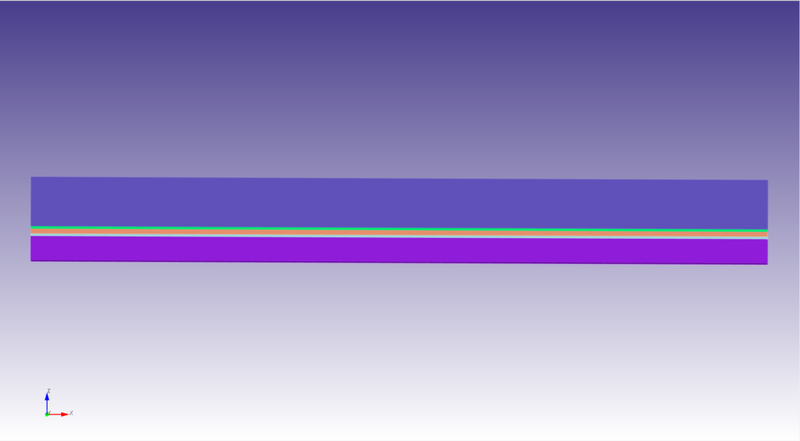 Step-by-step geometry creation in a generic simulation software. Our geometry is not done yet. We now have to create the StackUp of the touch sensor. To do so, we create the necessary volumes by selecting Brick Creation in the command panel, and then move them to the respective z-layer by using the move operation. If you are an expert, this step will take you about 5 minutes. But if you are not, be prepared to spend up to 20 plus minutes in this step, or even more, if you need to get familiar with the interface and the operations of the software. After we have added the volumes of the StackUp, we are done with adding geometries to the design. You can see the 3D design we have created so far below. Obviously, the software does not know what each surface or volume is made of. So now, we have to go through what is called Material Assignment. In this step, we give properties to each surface or volume that correspond to those of the materials the actual sensor will be made of. As for the X and Y electrodes, they are set and simulated as thin conductors. Assigning materials to the volumes. At this step, we look into the library of predefined materials of the software. If any of the materials that we wish to use is not ready-to-use from the library, then we have to carefully look up and specify its properties and add the desired material to the library manually. After the materials have been assigned, we need to specify the boundary conditions, in other words to incorporate physics into our model. As we are solving this example on our software CHARGE, this step is omitted. CHARGE uses the Boundary Element Method (BEM) , so no boundary conditions are needed. If the software used the Finite Element Method instead of BEM , then the boundary conditions would be necessary for capacitance analysis. Applying the right boundary conditions is really tricky for non-expert users or non-scientists, as they can totally skew the results or produce errors, not allowing the user to proceed with the simulation. Then comes the step that is a headache for non-experts and experts alike: Meshing. Meshing is a fine art, and creating the perfect mesh can always be a challenge. Mesh density is too important not to take seriously: mesh too densely and your simulation time will skyrocket; don’t mesh densely enough in points of interest and it can be catastrophic for your simulation results, as they will be totally off. The general rule of thumb for capacitance analysis is: the mesh should be denser in the conductors (even more dense in the active one) and sparser in the dielectrics and the grounded plane. So, we have to mesh each material (or group of materials) separately. The mesh should also be denser in areas with complex geometry (e.g very small bridges in a diamond co-planar pattern etc.). Thus, properly meshing the design can prove quite time-consuming. The mesh of the conductors. Now, we can move onto the analysis of the model. We choose the conductors that we want to activate and we assign potential to them. Again, adding too low or too high values in some of these parameters can dramatically increase the simulation time or increase the error in the results. So, the user should have some experience in simulation to be able to properly specify the solver requirements. Once the solving process is complete, the results data can be exported as a txt for further analysis. Note: In this example, we did not set a pointer (finger) touching the sensor to see the difference in the capacitance with or without a finger present. To do so, we would have to design a cylindrical volume, place it where we want to, and mesh the cylindrical volume. That is how you run 1 iteration of the touch sensor’s design in a traditional simulation software. Now, let’s assume that you want to examine the behavior of a thicker or a different cover glass. What that essentially means is that the top layer of the sensor would have a different thickness and a different relative permittivity. If the software you use does not allow parametric analysis, it means that for each thickness and permittivity you want to investigate, you will have to go back to material assignment, make the adjustments on the top layer and then do the same steps over and over, for each thickness/permittivity combo. The same steps, more or less, will be followed when simulating the sensor using Fieldscale SENSE. First up, we have to create the pattern of the electrodes. Thankfully, the Diamond Double pattern is one of the predefined patterns featured in SENSE, so the user does not need to do any CAD. So, after we set the dimensions of the whole sensor and its bezels, we move to the creation of the pattern. Setting the dimensions of the whole sensor. 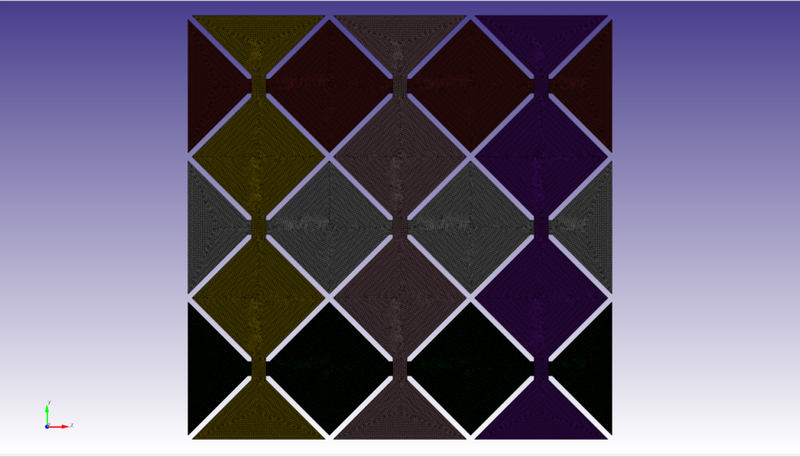 Diamond Double is one of the predefined patterns, ready-to-use inside SENSE’s library. SENSE’s library features some of the most used patterns in the industry, such as Manhattan and Diamond Co-Planar. But if we were to use a custom pattern, we could simply import its .dxf file in SENSE, and build up the simulation settings from there. Then, we go on and define the geometrical properties of the cell of the diamond double pattern. Setting the dimensions of the pattern of the electrodes. This step will only take 5 minutes, whether you are a simulation expert or not. As you can see, everything about geometry creation is automated and intuitive. Next up, we have to add the StackUp to the design and apply material attributes to the volumes. Again, SENSE makes this step super simple! This is done in the StackUp section. We pick the amount of layers we want to use and then we choose the thickness and material of each layer. SENSE has a library that includes most of the materials used in touch sensor design, so in most designs we won’t need to add materials ourselves. Again, the simplicity of SENSE drastically decreases the time spent on this step for experts and non-experts alike. Creating the StackUp and adding material attributes shouldn’t take more than a couple of minutes. SENSE’s solver also uses the BEM method to solve the model, so it does not require boundary conditions. More time saved, more time earned! But the most important strength of SENSE is that it automatically takes care of meshing for us. 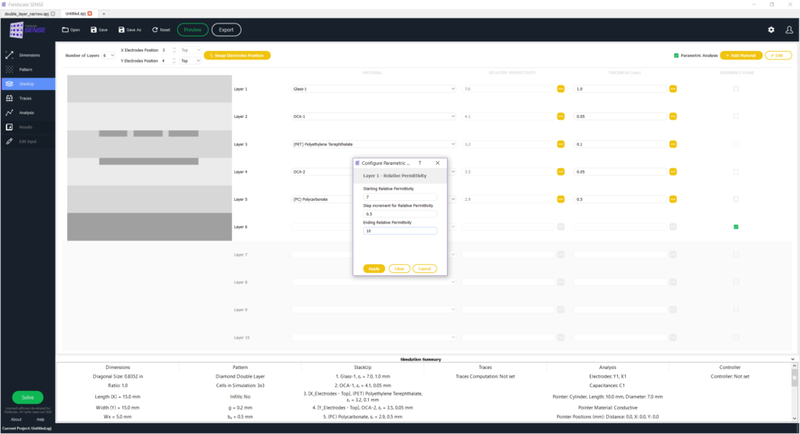 SENSE features automatic mesh refinement (or AMR), to make sure that the optimal mesh is chosen for each design, so that high accuracy and fast solving times are achieved. So now, we’re ready to solve our model. We move to the Analysis section. Here, SENSE lets you choose which capacitance you want to calculate and gives you the ability to add a pointer on (or hovering above) the touch screen. As we can see, geometry creation of the pointer is also fully automated and so is its mesh. Selecting an additional pointer analysis will allow as to compute the difference with the no pointer one and finally evaluate the sensitivity of our design. Once we’ve decided if and where we want to place the pointer and which capacitances we want to calculate, we just hit Solve! When the model is solved, we can see the results in the Results section. Fieldscale SENSE interface: Analysis tab. Capacitance map. There, we can see a capacitance map of the sensor. If we wanted to further process the results, we could export them in a .csv file, or we can download the entire project input and output in a pdf file automatically. If we want to refine the design, there is no need to go back to the drawing board each time. 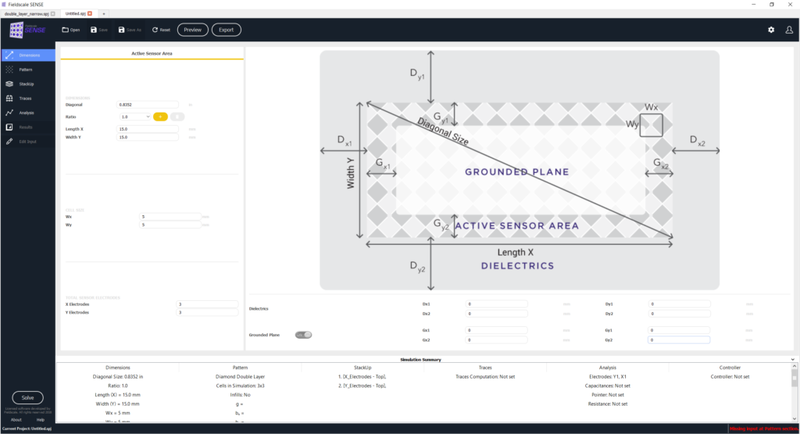 SENSE features a Parametric Analysis option. 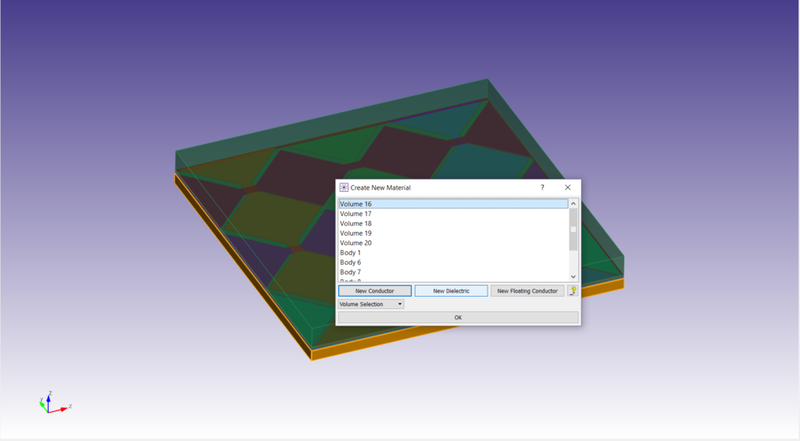 Considering the same problem as before, that of cover glass selection, we simply go to the StackUp section and select ‘parametric analysis’ for the first layer. Then, we add the starting and ending values of the permittivity and the thickness, as well as the step increment. By simulating all the produced projects of the parametric analysis, we will eventually reach the optimal pair (permittivity, thickness) of the top layer based on the our desired functionality. 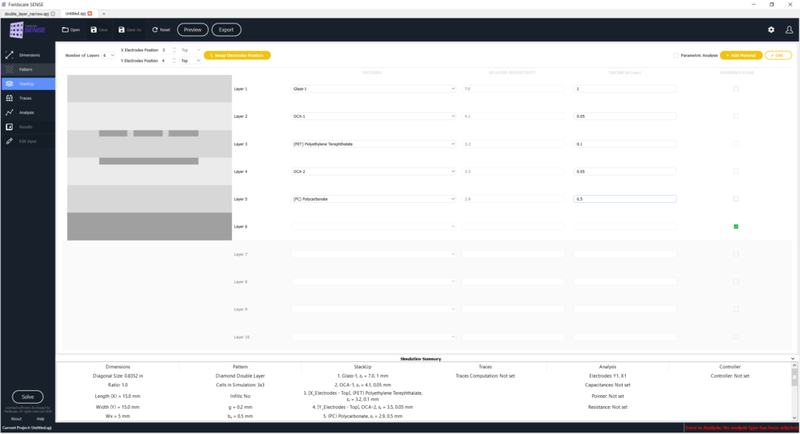 Fieldscale SENSE interface: Parametric Analysis configuration, StackUp tab. 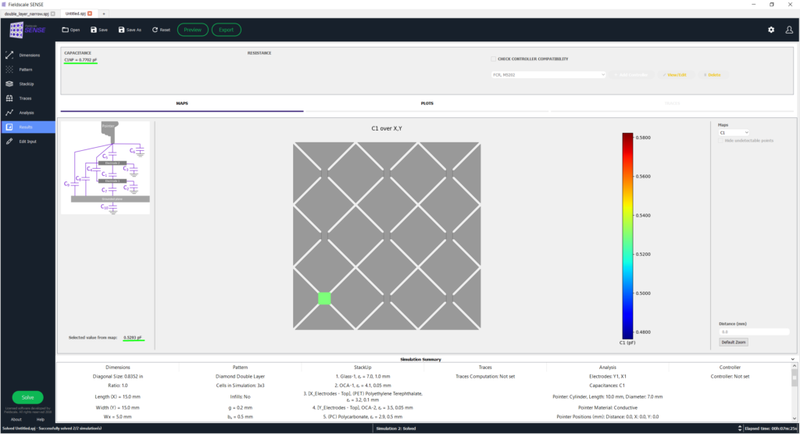 In this article, we simulated a Diamond Double touch sensor from scratch. First, we did it using a generic simulation tool. Since we had to create the geometries ourselves and mesh the design, we found the Preprocessing stage time-consuming and frustrating. A non-expert or a newbie in simulation world would undoubtedly find this task hard. Then, we used the application specific software, SENSE that’s exclusively for PCAP touch sensors. Things were much more quick and intuitive: no need for design and no need for meshing. Preprocessing took a fraction of what it took before, which means more time to analyse the results, especially if we were on a strict deadline, or wanted to go to market faster! Up until now, touch sensor simulation required expertise and time. Now, Fieldscale SENSE makes the user an instant expert, in a fraction of the time. Wanna save time during the preprocessing phase? 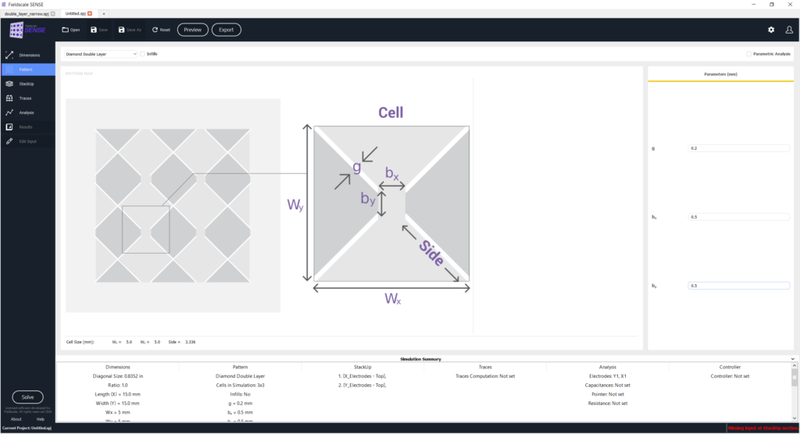 Try out SENSE, the only software for touch sensor design and validation. Get your free trial and start using it from day one!